"Learn from yesterday, live for today, hope for tomorrow" Wise words from Albert Einstein on this day. It's the start of a new year, a new beginning, carrying on from where we left off from last year. Has anybody told you that you are the greatest thing that has ever existed for you to be the best you can ever be? You will know what you need to do to be the best and surpass the goals you have set for yourself. 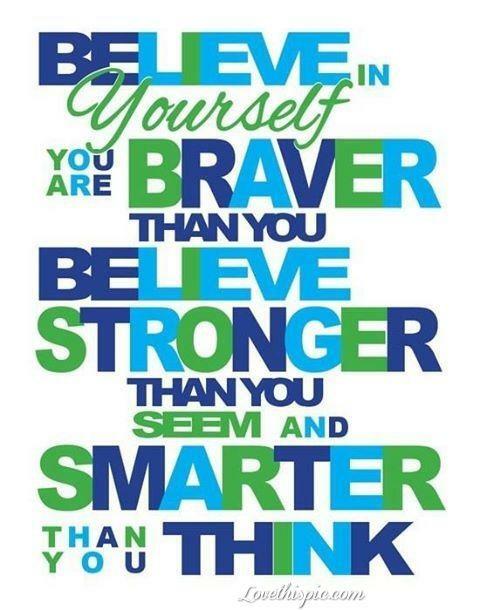 You just have to be inspired, believe in yourself and feel the difference! It doesn't always feel like this though. Everything seems out of control and our NHS is being stretched to the limit and perhaps even beyond that. If you fell in a puddle, you wouldn't call the coastguard is a blog written by a GP, Dr Prit Buttar trying to explain what has gone wrong in A&E and the Out of Hours. There seem to be 4 types of patients - those who are genuinely ill with a "real" accident or emergency, secondly people requiring repeat prescriptions, thirdly people requiring things that the GP practice would provide eg fit notes and finally those with trivial illnesses (minor ailments or self-limiting conditions) which will resolve on their own. If left unchecked, this rise in intolerable demand could have more sinister consequences. "Patients with genuine needs will suffer while the system chokes with trivia". Nobody wins then. Unhappypatients, unhappy staff, unhappy doctors and nurses. "Tackling demand means telling people they are using the service inappropriately". But let's stop patient-blaming says @betabetic incensed that patients are being told to "go away" when they may have a serious underlying illness as in her case. 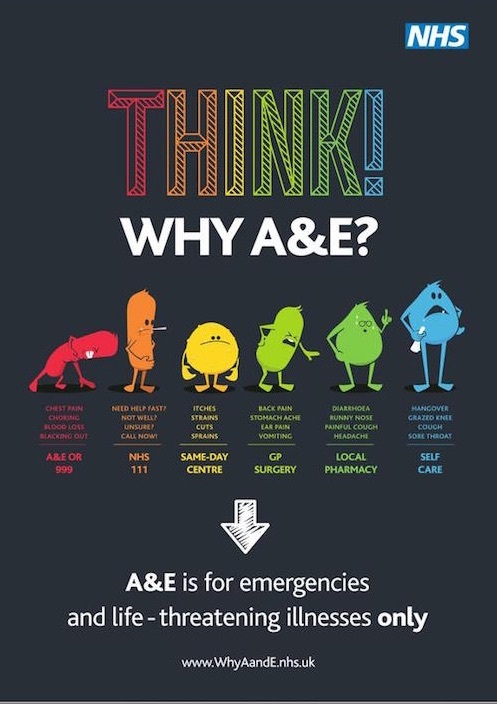 Her A&E "go away" story is a sobering reminder that patients can sometimes have serious underlying illness which can be missed and all is not as it may seem. Her answer is deceptively simple "give advice about self-care, apply layers of triage, have an on-site pharmacy, run multiple queues, get rid of the ridiculous 4 hour target but never ever tell a patient to go away". So what have we done or experiences have we have come across this year to try to help improve the quality of our services for our patients and ensure we can get the best outcomes for them? Firstly let's be clear. It is great that so many people are living longer despite the challenges in their health and we are really pleased that people have benefited from the advances over the years in healthcare and other public health, water and sanitation and all the other reasons why people are living longer. You are doing great! We have to see beyond this to see how we can help support you and your loved ones and what we can do together. That's what really matters. We will not always get it right and sometimes things do get missed (we are all human after all) but if we can work together and understand how the system benefits you then maybe it may just work and lead to better outcomes for all! Ingrid Brindle and Dr Hannan were invited to present at the HSJ Rising Stars conference in March. Many of the stars in the NHS who have worked tirelessly to improve services gathered together to learn and share ideas with each other. Listen to some of them hear about the exciting things that are happening below. Ingrid, chair of Thornley House patient participation group, was inspired by Pollyanna Jones and the team behind NHS Change Day and the idea of NHS Pledge Day where staff in the NHS pledge to do something to make the NHS better. She came back and began to ask what can patients do to make a difference. 4 months later and with the help of Dominic Sexton, Jacqui Gladwin and Marilyn Gollom, the team launched Health Pledge 2015. The Big Idea it seems is actually to simply do something small for your own health which when connected with everybody else makes the world a better place for everybody. Brilliantly simple advice that we can all do singly or as a group. Health Pledge was launched with great fanfare in November by the Mayor of Tameside and with Sir John Oldham and Tameside Voices at Clarendon Shopping Centre. Already over 120 people have made health pledges. But this is just the start. The team behind Health Pledge 2015 are hoping by the end of the year we will have over 1 million health pledges. Imagine the impact of that - up to a million people making a difference. You can see pledges people have made publicly (whilst some have kept them private too for those not wanting to share what they have pledged too). If you have not done it yet then now is your time - make a pledge! We were very pleased to hear one of our longstanding patients and biggest proponents for giving patients access to their records was recognised by the Health Service Journal to be a top 50 innovator. You can see a video of her talking about what it meant for her and see how she accesses her records. Sadly in September she passed away but here you can see many of the wonderful things she did over the years to help inform patients and the public what they can do and what she had been able to do since 2006. She has left behind a legacy for others to follow and learn from. Nicola Jeffery-Sykes went on BBC Breakfast news to talk about her own experience and frustration of being looked after by multiple doctors in multiple hospitals and nobody knowing what was going on because the information was not available where it was needed. This contrasted with Ingrid's experience, sat in her kitchen merrily reading and being able to learn and share her record whenever it was needed - her need to see the information about her being the greatest to help manage her own health! Concerns have been raised too - this is not easy. This year ended with a very significant rise in the number and proportion of patients signing up for online services. The numbers are now rising to become meaningful and shows patients are responding positively. On 31st December 2014, 31% of patients have now signed up for online services (3719 patients). But this does not tell the whole story. 50% of patients with Rheumatoid Arthritis, 38% of patients with Asthma, 40% of patients with low back pain, 36% of patients with cancer, 22% of patients with kidney disease, 43% of pregnant women, 16% of patients with learning difficulties and 28% of Bengali patients have now signed up! And what about patients with minor ailments? Can they benefit? 33% of patients who have ever suffered with an Upper Respiratory Tract Infection have now got access to their records. Imagine that? Patients now no longer have to try to remember what their doctor or nurse has advised but instead can learn from their previous experience so that if the doctor or nurse has given them advice, they can read what has been said in the comfort of their own home or wherever they may be. Ebola is in the news after the first person to be identified with the virus whilst on UK soil. What do you need to know about Ebola? We take the fear out by providing practice-specific information for you to refer to and which we update as the need arises. The landing page www.htmc.co.uk has been designed to view easily on a tablet or a smartphone and where the main webpages that people need can be easily accessed. The main website is where a lot more detailed information can be found. Most information patients will need is found at the top of the webpage but as you go down the page on the sides you will find more detailed information including healthcare websites you can search for specific conditions or medications on, what is self care for family and friends, specific health concerns starting from contraception, support and friendship for families, advice on losing weight, embarrassing problems, cancer, my ageing parent, dementia guide, end of life care and when someone dies. It really shows the breadth of what general practice now offers and how complex the needs of patients and their families are! There is a whole section on domestic abuse, Asian domestic abuse and an article on emotional abuse and what to do. Denying these things will not make them go away - let's deal with them and help people to stay safe by ensuring everybody knows how to seek help and where to turn if they are at risk or currently under duress. Many people are stressed due to money worries so we signpost you to help with benefits, information on universal credit, a self-help benefits advisor, finding a job and the money advice service. There is other advice as well. One of the biggest challenges is how to inform patients and the public what help there is. This came to sharp focus after the government announced Care Data and the Information Commissioners Office informed GPs it was our responsibility to inform patients what this means for you. We responded immediately by placing it at the top of the main website for people to know what care data means and what choices you have and how many people have chosen to opt out of the scheme (which is currently the only choice patients have). There was a lot of concern expressed in the Patient Participation Group on how we were reaching out particularly to people who do not usually come to the practice. Following a meeting on the need to set up social media sites, we launched our Facebook webpage and Twitter account - you can watch what was discussed here. Here is our Facebook page and twitter account. Please like us and join the group - it's a great way to keep informed without having to keep coming to the surgery. Of course we still send emails out to all patients who sign up for online services. That's a personal email to your inbox which you can read at leisure and keep one step ahead and provides you with specific information about the practice or what may affect you! The practice is informed about local developments and we can then forward this information on to others. For example, we received a message from Dr Alan Dow, chair of Tameside & Glossop CCG informing us that this year Tameside Hospital fared relatively well in keeping A&E open and safe but there was a significant increase in patients presenting to A&E and out of hours for repeat prescriptions they had forgotten to collect or order prior to the Xmas break. Of course our patients were informed via Facebook and email to get their prescriptions early. It's not just the young and IT savvy people who are signing up. 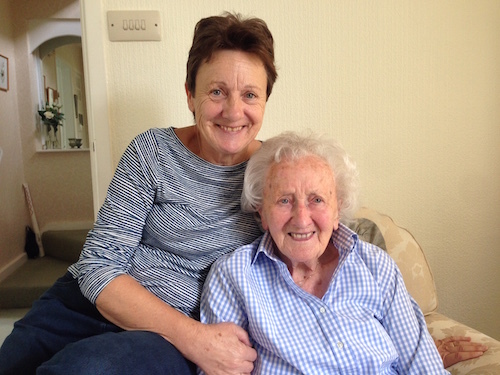 This year our oldest patient to sign up for online services, Edith aged 100 signed up with the help of her daughter - families help families is a recurrent theme we are seeing time and time again. Talking about families, what about the community? Louise Brady, practice nurse at Donneybrook surgery and Susan Mason-Cave, Diabetes Specialist Nurse came together and launched the Magical Diabetes Event. When Cagney met Lacey...aka Louise and Susan. Despite many challenges, they worked closely with patients and the public to put on an evening of entertainment, hot supper and invited patients living with diabetes (Diane Moran and David Cragg) as well as GPs to talk about diabetes, what it means for them and also how to improve your own health. Heather Henry talked about Salford Dadz and the work she has been doing on asset based community development. It was all in aid of Diabetes UK and they raised over £700 with more than 160 people attending! Hilda aged 85 talked about her diabetes and her daughter Jean explained how she is helping her too as her main carer. Eric Evanson, chair of Donneybrook Patient Participation Group, talked about the important role patients have in learning about their own healthcare needs and taking greater responsibility for their own health supported by the practice. Patients at the practice have been essential in helping us all get a better understanding of your needs. You have helped to contribute to the world's understanding of what this all means. You may ask how? You helped to publish a paper in the International Journal of Medical Informatics entitled "Accessing personal medical records online: a means to what ends?" by Syed Gulam Sarwar Shah, Dr Richard Fitton, Dr Amir Hannan, Dr Brian Fisher, Professor Terry Young and Professor Julie Barnett. The research has shown patients do use electronic health records for personal health management, patients trust the information provided in the electronic health records and accessing electronic health records creates a new set of expectations amongst patients. The Queen's Nursing Institute published a guest blog "Towards a Partnership of Trust" describing this relationship between patients and clinicians and how technology can help to enhance the relationship by helping to build trust and for once not being in the driving seat! It's not just our patients though - there is a change happening out there and 2015 could well be the year we see a big change. Roz Davies thinks there may be an epidemic of "digital citizenship" as we reach a tipping point and people begin to realise we all need to work towards that tipping point when healthcare moves to the next level. Nobody finds change easy - if it was then we would all be doing it all the time. This blog by John Walsh, Sarah O'Donnell and Dr Hannan about trees and change movements seems apt now. As Dr Umesh Prabhu says, radicals are regular guys with radical vision and values! Ask John to find out how! Glen Griffiths, Dr Richard Sills and Jon Witte have done an amazing job getting our touchscreens working and also to ensure we can use Instant Medical History in the surgery. It's still very new technology and we are learning how to embed this in the workflow. Watch this space as we hope in 2015 to be able to use this more with patients and start to see patients co-producing the record by providing us with a much more detailed and in-depth history so that we can better meet your needs. It needs investment in time money and resources but we think it could make a big big breakthrough and help relieve some of the pressure we are facing. Our staff have been fantastic throughout the year, taking on new ideas and helping to support patients as we aim to deliver an excellent customer service in keeping with our stated mission: "There for you all your life, your good health with our support, empowering you to live well". The staff are currently organising themselves to really take this on board and understand what this means from the perspective of a patient so that their job reflects this and in turn we hope you find us to be more responsive to your needs. But of course with very limited resources and increasing demand we need your help too so that we can share this responsibility between us where possible. It's the little things that matter. Anybody can send a complaint in (and many do!) but how can we all work together towards a common goal and a common purpose. A special mention to Wendy Smallwood, our practice manager, who has been with us for over a year now and really helped to transform the practice. She is the one who has to deal with most of the complaints from patients, staff, the CCG, NHS England, MPs - you name it she deals with it. Amazing how she still comes to work with a smile every day and just gets on with it. That's what successful people do. Everybody agrees she has been a rock that has helped the practice to stay focused on the job at hand with support from Megan Harrison, her assistant and the receptionist supervisors Tracy Hibbert at Haughton Vale and Sandra Adams at Thornley House. Our doctors, nurses, healthcare assistants, reception staff and secretaries and even the cleaners have worked exceptionally hard to go the extra mile. We have worked as a great team whilst recognising each person's unique skills and abilities. Managers provide the context for patients and clinicians to excel. Many of the patients who are using online services now are finding the practice meets their needs better. We do realise that not everybody is online or wants to be but if only a few more people use the online services, it may free up vital resources for those that really do need to see the doctor or nurse. So next time you ring up to ask if a scan is back or if you are being referred to the hospital or you need to fill a self referral form, rather than asking for an appointment with the doctor, think about asking how you can do this and who can help support you in the practice. Ordering your prescriptions online, checking when your appointment is due, checking what has been agreed with the doctor or nurse by going online before your appointment is due, downloading the smartphone app that allows you to view your records and order prescriptions online easily. It's a little difference but it may make a big impact if more of us do this. Loneliness is a major problem with 60% of households in Tameside now only having one person. This becomes even more challenging as you become older and more frail. That's why we have teamed up with other practices in Hyde to invest in a new service alongside New Charter to help support elderly vulnerable people and to try to meet their needs which may often be less to do with medical problem and more to do with social issues or perhaps financial, benefits and debt management. But if we do not help to solve housing / benefits / debt problems then these patients will end up with healthcare problems. We are currently doing a pilot but if it proves to be successful then we hope it could lead to a wider rollout. We have been assigned an elderly care support worker who is working with us and meeting elderly people over 75 and their families to help meet their needs. She will be able to help them to sign up for online services too as well as help resolve problems. Often the solutions lie in the community with other voluntary sector organisations but the patients do not know about their existence or how to access them. It's a simple idea but for some of the most vulnerable in society, it could make the difference between staying healthy or spiralling into a miserable existence when this may not be necessary. This year, we have seen a big rise in Foodbanks. It's really sad when people on our doorstep within our communities are starving and do not know where their next meal will come from. Eric Bynon and Susan Edwards, members of our Patient Participation Group have been keeping us informed about the food bank. We have actively supported them and encouraged patients and the public to bring non-perishable food stuffs in so that we can pass them onto the food bank. You can learn more about the food bank, how people get trapped easily into poverty and starvation and how you can donate to the food bank too - remember every little bit helps. Just before Christmas, Eric said "Over the last few days I have picked up three boxes of food from the surgery and it was used at St Marys Food Bank. During two days Tuesday and Wednesday the Church issued 187 packs of food. Each pack was sufficient to provide each family with food for three days. Each child in the family also received a Christmas present. The work of the Patient Participation Group at Thornley House led by Ingrid Brindle and at Haughton Vale Surgery led by Eleanor Simmonds has moved on. Thornley House has teams of people leading on the Food bank, workshops to help inform other patients on how to access their records and understand them, liaison and communication with other bodies outside the practice, the IT team (looking after the practice webpage and also answering email queries) and the Health Pledge team. You can email them directly on thornley.house.ppg@gmail.com. The Haughton Vale PPG is also working on a variety of issues looking at the practice waiting room area, raising awareness of the Minor Ailment scheme, health pledge 2015 and the food bank. Their email address is haughton.vale.ppg@gmail.com. We are always looking for new patients to join the PPG (whether by email exchange or to come to meetings). If you would like to come along or perhaps raise awareness of an issue that affects you, a group you may be a part of or represent or a type of condition eg diabetes, back pain, obesity, Black or Ethnic Minority member, child, adolescent, young parent, alcohol or drugs, homeless - we would love to hear from you. We want the PPG to be representative of the patient population so that we can learn about your experience of services and how we can meet your needs better. Locally practices have started to move towards offering online services too including Davaar Medical Centre, Donneybrook, Clarendon, Manor House and Hadfield Medical Centres, Awburn House, Lambgates and others. We will be working closely with Tameside & Glossop CCG and John Winter during the coming year to share our experiences and join with others to help deliver services across Tameside & Glossop and beyond. John Walsh and Lisa Falkingham wrote a blog about the wisdom of Maya Angelou who also died earlier this year but gave us many pearls of wisdom about living, self power, raging or living, wisdom, humour, self-nurture, priority and our influence. Talking of things from afar. Dr Edwin Kruys is a GP in Australia who heard about what we were doing, interviewed Dr Hannan and then wrote a blog on empowering patients, wha the benefits are, what the risks are and tips for others. He doesn't care about left or right politics - just do the right thing. A simple idea made available on the other side of the planet for all to see - the world really has become a village for some and yet for others our next door neighbour may as well be on the next planet. We still have so much to learn. In 2015, we would really like to take things to a whole new level by increasing the number of patients signed up for online services and actively engaged in their healthcare using those services. We would like to invest much more in supporting people in the community so that they become knowledge sources that are more visible for all to see. Increasing people's resilience and ensuring people have more confidence to manage their health and well being will be essential (Thanks to Patrick for helping me to understand this more clearly). This also means improving the health literacy of people in the community too. (Thanks to the Health Foundation and Richard Osborne). We would like to try to capture more patient stories that capture the essence of what it means for them and enable others to learn too eg Patient Memoirs (Thanks to Dr Farhan Amin). We will need to reach out and understand Cultural Humility and practice what we say. (Thanks to Professor Anil Jain). We would like to work more effectively with patients to ensure as the NHS tries to evolve in very difficult circumstances, we can meet your needs better and not turn people away but ensure the limited resources we all have (including you as patients and carers) are used to maximum effect and we reduce wastage to a minimum. We hope staff in the practice are even more focused on delivering a patient-centred approach where you feel you have been listened to and your concerns have been acted upon, where the care delivered is even safer and of an even higher quality and your experience is the best it can be. We want to spread this message to all corners of the country and the world so that others may develop this in their own way too for our NHS. We want everybody to benefit so that all get the best care and attention possible and we help to reverse the health inequalities that currently exist. by working with people with lived experiences and supporting the right leadership, we can change the look and feel of the NHS in the frontline as well as in the leadership at the centre. Most of all we hope you feel safe and that we can inspire you to believe in yourself and feel the difference such that others begin to crave it too and we can spread this to all corners of the world and learn from others too. Certainly the 5 year forward review from NHS England is inciting us to do more, quicker, more easily and with determination. Now is our moment for change! So that's it. We are sure we have missed out many other things and people and if you think of any that you would like us to highlight them please email them to us on htmcpatient@nhs.net (no medical confidential info please - email is not safe). 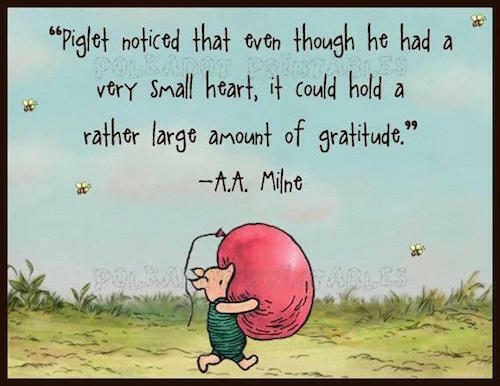 We'll finish with this little quote from piglet. Thankyou for all your gratitude from all the staff at Haughton Thornley Medical Centres. We could not have done this without you!